The first buses have started to run along Cambridgeshire's Guided Busway. The 25km guideway along the disused St Ives to Cambridge railway line will link Huntingdon and Cambridge. Four manufacturers will this week test their vehicles along a completed section of the route near Oakington, checking how well they perform. Bus operators will then be able to decide which is the best to buy. The busway project aims to cut congestion on the A14. 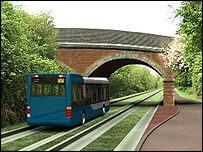 A guided busway is a dedicated track just for buses to drive on. New facilities for cyclists, pedestrians and horse riders will also be provided along the route.